"Taketori Monogatari" redirects here. For the 1987 film, see Princess from the Moon. 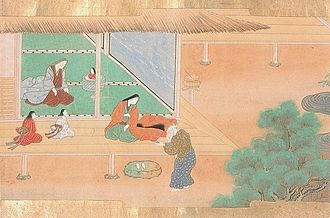 The tale is also known as The Tale of Princess Kaguya (かぐや姫の物語, Kaguya-hime no Monogatari), after its protagonist. It primarily details the life of a mysterious girl called Kaguya-hime, who was discovered as a baby inside the stalk of a glowing bamboo plant. One day, while walking in the bamboo forest, an old, childless bamboo cutter called Taketori no Okina (竹取翁, "the Old Man who Harvests Bamboo") came across a mysterious, shining stalk of bamboo. After cutting it open, he found inside it an infant the size of his thumb. He rejoiced to find such a beautiful girl and took her home. He and his wife raised her as their own child and named her Kaguya-hime (かぐや姫 accurately, Nayotake-no-Kaguya-hime "princess of flexible bamboos scattering light"). Thereafter, Taketori no Okina found that whenever he cut down a stalk of bamboo, inside would be a small nugget of gold. Soon he became rich. Kaguya-hime grew from a small baby into a woman of ordinary size and extraordinary beauty. At first, Taketori no Okina tried to keep her away from outsiders, but over time the news of her beauty spread. 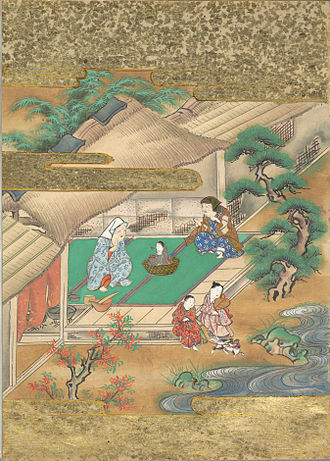 Eventually, five princes came to Taketori no Okina's residence to ask for Kaguya-hime's hand in marriage. The princes eventually persuaded Taketori no Okina to tell a reluctant Kaguya-hime to choose from among them. 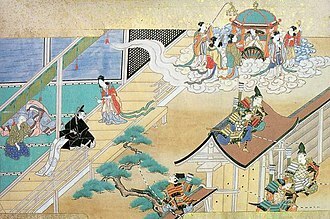 Kaguya-hime concocted impossible tasks for the princes, agreeing to marry the one who managed to bring her his specified item. That night, Taketori no Okina told the five princes what each must bring. The first was told to bring her the stone begging bowl of the Buddha Gautama Shakyamuni from India, the second a jeweled branch from the mythical island of Hōrai, the third the legendary robe of the fire-rat of China, the fourth a colored jewel from a dragon's neck, and the final prince a cowry shell born of swallows. Realizing that it was an impossible task, the first prince returned with an expensive bowl, but after noticing that the bowl did not glow with holy light, Kaguya-hime saw through his deception. Likewise, two other princes attempted to deceive her with fakes, but also failed. The fourth gave up after encountering a storm, while the final prince lost his life (severely injured in some versions) in his attempt. As the day of her return approached, the Emperor sent many guards around her house to protect her from the Moon people, but when an embassy of "Heavenly Beings" arrived at the door of Taketori no Okina's house, the guards were blinded by a strange light. Kaguya-hime announced that, though she loved her many friends on Earth, she must return with the Moon people to her true home. She wrote sad notes of apology to her parents and to the Emperor, then gave her parents her own robe as a memento. She then took a small taste of the elixir of life, attached it to her letter to the Emperor, and gave it to a guard officer. As she handed it to him, the feather robe was placed on her shoulders, and all of her sadness and compassion for the people of the Earth were forgotten. 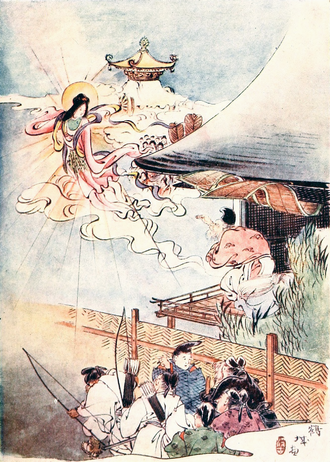 The heavenly entourage took Kaguya-hime back to Tsuki-no-Miyako (月の都; lit. "the Capital of the Moon"), leaving her earthly foster parents in tears. The 1975 Japanese TV series Manga Nihon Mukashi Banashi (Cartoon Tales of Old Japan) contains a 10-minute adaption of the story, directed by Takao Kodama with animation by Masakazu Higuchi and art by Koji Abe. Studio Ghibli released in November 2013 in Japan an anime film based on the folktale under the title of The Tale of the Princess Kaguya. Jump up ^ Katagiri et al. 1994: 95. Jump up ^ Katagiri et al. 1994: 81. Jump up ^ McCullough, Helen Craig (1990). Classical Japanese Prose. Stanford University Press. pp. 30, 570. ISBN 0-8047-1960-8. Jump up ^ 田海燕, ed. (1957). 金玉鳳凰 (in Chinese). Shanghai: 少年兒童出版社. Jump up ^ 百田弥栄子 (1971). 竹取物語の成立に関する一考察. アジア・アフリカ語学院紀要 (in Japanese). 3. Jump up ^ 伊藤清司 (1973). かぐや姫の誕生―古代説話の起源 (in Japanese). 講談社. Jump up ^ 奥津 春雄 (2000). 竹取物語の研究 (in Japanese). 翰林書房. ISBN 4-87737-097-8. Jump up ^ テンジン・タシ, ed. (2001). 東チベットの民話 (in Japanese). Translated by 梶濱 亮俊. SKK. ^ Jump up to: a b 繁原 央 (2004). 日中説話の比較研究 (in Japanese). 汲古書院. ISBN 4-7629-3521-2. Jump up ^ Manga Nihon Mukashi Banashi (TV '75), Anime news network. Retrieved 2014-10-04. Jump up ^ The Tale of Princess Kaguya, Pelleas. Retrieved 2014-10-04. 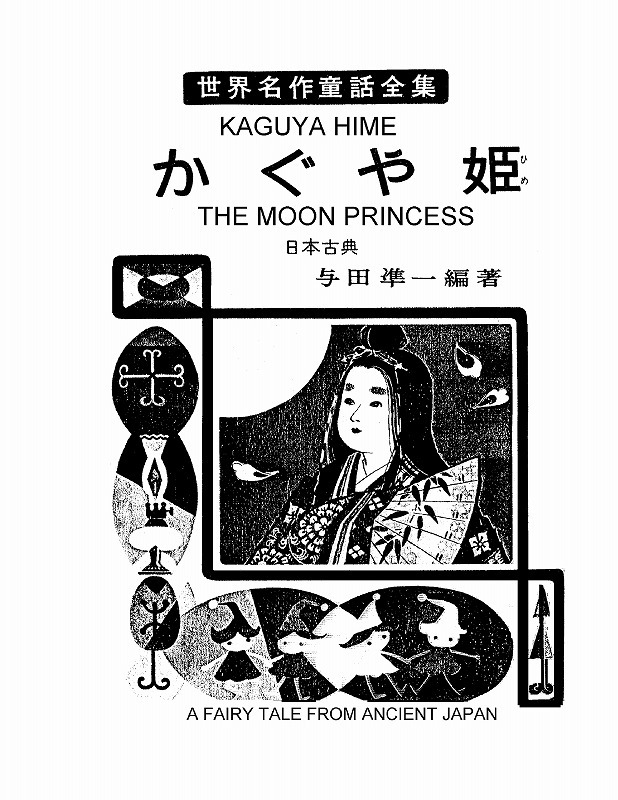 Jump up ^ "Kaguya-hime monogatari" (in Japanese). JP. Retrieved December 29, 2014. Horiuchi, Hideaki; Akiyama Ken (1997). Shin Nihon Koten Bungaku Taikei 17: Taketori Monogatari, Ise Monogatari (in Japanese). Tōkyō: Iwanami Shoten. ISBN 4-00-240017-4. Satake, Akihiro; Yamada Hideo; Kudō Rikio; Ōtani Masao; Yamazaki Yoshiyuki (2003). 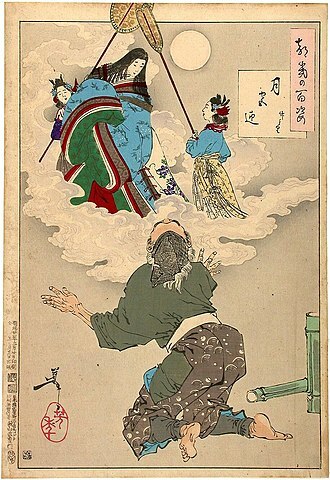 Shin Nihon Koten Bungaku Taikei 4: Man'yōshū (in Japanese). Tōkyō: Iwanami Shoten. ISBN 4-00-240004-2. Yamada, Yoshio; Yamda Tadao; Yamda Hideo; Yamada Toshio (1963). Nihon Koten Bungaku Taikei 26: Konjaku Monogatari 5 (in Japanese). Tōkyō: Iwanami Shoten. ISBN 4-00-060026-5.